Data visualization tools can help bring data traditionally contained within finance to the rest of the business -- in a readily digestible format. A picture may be worth a thousand words, but data visualization is worth much, much more, experts say. With the use of advanced data visualization tools, finance leaders are now able to translate broad and deep sets of data into easily digested, actionable intelligence for the entire company. "The big benefit for finance is that it puts the story right in front of everyone's eyes," said Elissa Fink, chief marketing officer at the Seattle-based data visualization software vendor Tableau Software. Finance departments are awash with data, she continued. "It's all over the place: in spreadsheets, in databases, in data warehouses, in reports from various systems … cost systems, budgeting systems," Fink said. "But if they can really see the data rather than looking at endless rows and columns of numbers, they begin to comprehend what's going on much faster." Traditional graphics like bar and pie charts have been around for years, but new technology has enabled the use of more dynamic visualization, such as dashboards that can be updated in real time and interactive charts and graphs that can be drilled into for deeper discovery. Vendors such as Tableau Software, SAS, TIBCO Spotfire and Oracle rank among leaders in the field of visual discovery, according to a 2012 Forrester Wave report. Microsoft, Actuate and QlikTech, among others, were close behind. 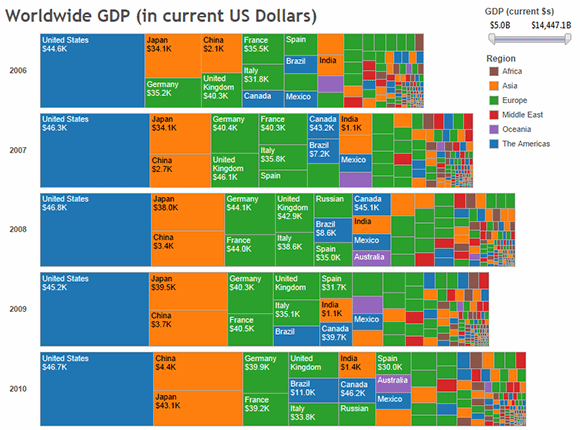 The power of data visualization now goes beyond the adage, "a picture is worth a thousand words," said Boris Evelson, vice president and principal analyst of business intelligence at Cambridge, Mass.-based Forrester Research Inc., and co-author of the 2012 Advanced Data Visualization Platforms report. "It can now tell us things that we can't see by just looking at the numbers." For finance leaders, data visualization is a critical tool for communicating across operational departments and helping all areas of an organization quickly grasp actionable insights. After all, not everyone is fluent in the language of finance. "It creates a nice common framework of understanding between finance and other teams," Fink said. "And that has benefits for the teams, and benefits back to finance. There are fewer surprises and more predictability." What's more, this two-way communication, aided by data visualization tools, can help an organization develop metrics that support a business strategy because operational data can be easily linked with financial data, said Leo Sadovy, the manufacturing industry market manager at SAS Institute Inc. in Cary, N.C. "If I'm going to help business decision makers, I have to understand -- though we [in finance] think in terms of dollars -- it's really dollars per something or something per dollars." For example, Sadovy said, "I can start combining financial data with call center data to understand cost per call [or] cost per minute. I can start looking at production data and get yields and costs in that area. I can bring in head count data to get cost per person in different categories of the business." Then a company can drill down into one of those categories -- using any number of graphical representations, including geographical maps, heat maps, paths and scatter graphs -- to gather information that will help their leaders make decisions. Do they need to allocate resources differently? Do they need to establish a cost-cutting initiative or a productivity improvement initiative? Also, the ability to explore and play with the data allows organizations to employ "inductive reasoning," Sadovy said. He defined inductive reasoning as the ability to pull a wide range of data from many different sources and find new meaning. "You can start putting three or four things up on the screen and making correlations between them," Sadovy said. "The brain is good at that; the eyes are good at that." Jerry Pellizzon, long-time chief financial officer at multinational technical ceramics manufacturer Ceradyne Inc., understands the power of good data visualization tools. For 10 years -- until the company was sold to 3M in 2012 -- Pellizzon presided over the finance department during a time of exponential growth. As a result of such robust growth, Ceradyne, headquartered in Costa Mesa, Calif., needed to update its operation systems. 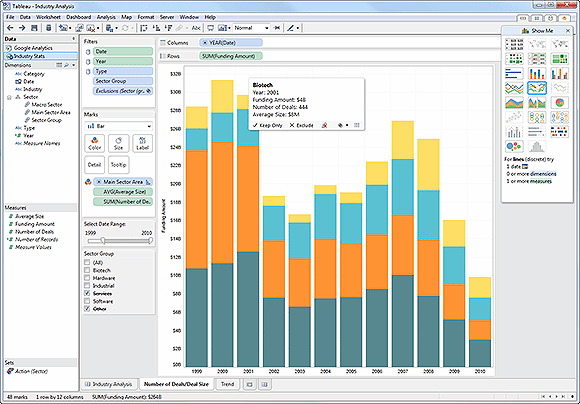 Part of that upgrade included the installation of Tableau Software data visualization platform, beginning in 2010. "We wanted to improve the speed, consistency and quality of information that our decision makers were receiving so we could analyze problems quicker and with the proper data and the proper view of the data get to better decisions throughout the organization," Pellizzon said. Staying on budget for such a large manufacturing company meant keeping an eye on approximately 300 departments that all had their own budgets. "And we wanted to know right away the trends within all these departments," he said. An important component of Ceradyne's operation was the allocation and use of labor and the manufacturing overhead associated with that labor. "There's a lot of heavy equipment being used. If we're running it too long, that adds up. It destroys our profitability," Pellizzon explained. Dashboards and performance graphs created using Tableau were positioned on monitors on the production floor and in the managerial offices of the plant that could show when there might be an imminent bottleneck in the production process. With these visuals in constant sight, the company could quickly reallocate people and resources to avoid a costly slow down. "We got the right data in front of the right people," Pellizzon said. He added that Tableau enabled the company to present data quickly and intuitively, in such a way that a wide range of people with varying skills could understand what was going on and what needed to be changed. The visualizations that the team at Ceradyne saw were multi-dimensional and full of color, Pellizzon said. "They weren't inundated with a lot of numbers and a lot of detail. They got the bigger picture, but specific to what they needed to be looking at." With data visualization, your mind doesn't have to recalculate numbers into intelligence, he added. "Your mind, instead, can analyze the data right away. You don't have to go do extra work. Most people prefer that." According to Pellizzon, they eliminated scrap, increased yield and boosted labor productivity, partly due to the ability to cull actionable data from otherwise murky sets of numbers. And this might be the most important benefit of all in the ever-expanding world of big data. How does a business make sense of the torrent of data that's constantly at its fingertips? And how do they use it to make their business run better? "Data sets can go very deep," said Evelson of Forrester. "If we have billions of rows of information that we want to analyze, there's no way anyone is going to look at a million-page report. It's just not going to make any sense." But if you can look at the data together, among departments, "and be interactive with it, understand patterns, and find outliers and find mistakes," Fink of Tableau said, "it creates a common language that makes digesting and acting on it so much easier." Does your finance department use data visualization tools? If so, which ones?